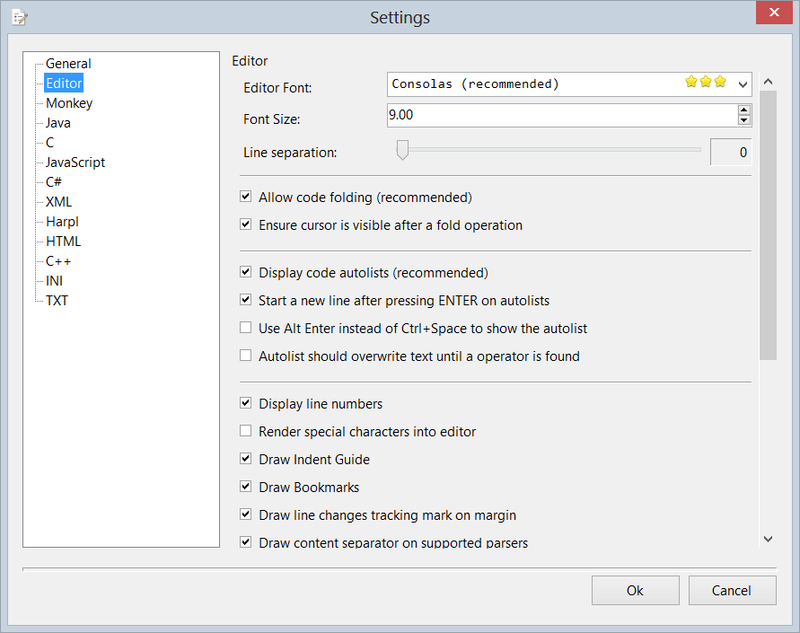 In this Settings page, you can configure all the Jungle Ide general settings. You can set here the font to be used by Jungle Ide in the source code editor. Jungle Ide will show a list of all available True Type fonts. A special “star” footprint is added on recommended fonts. You can set here the font size for the font to be used in the source code editor windows. Jungle Ide allows you to set additional pixels of separation between source code lines, in order to increase the readability of the source code text. This setting will enable code folding for all languages that support it. Code folding will allow the source code to be organized on collapsable regions. This setting is ignored in Jungle Lite as Jungle Lite does not support folding. Jungle Ide can display code completion auto lists that can help you as you type code. This setting is enabled by default on Jungle Ide. Notice that Jungle Lite does not support this feature, and this setting is just ignored in Jungle Lite. This setting will make Jungle Ide display line numbers in the editor window. Line numbers can also be seen in the caret position mark at the bottom-right corner of the IDE, so this setting is set to “off” by default. This option will make the editor window render special characters in the source code window, so all characters such as CR, Tab, white space, etc. are rendered with a visible glipth. This option will make Jungle Ide draw an indentation guide on the source code window. Jungle Ide can show a colored line changed tracking mark in the code editor window. This option allows the user to enable or disable this feature. By default it is enabled. Jungle Ide highlights matching braces as you type. Braces highlighting can be customized to work in 4 different modes. Select the desired mode here. If you select the “use custom color” braces highlighting mode, you can set the desired color using this setting. If this option is enabled, Jungle Ide will select a whole line of source code whenever the user clicks on the left corner of the source code editor window. Jungle Ide source code editor can work in word wrap mode, so horizontal scrolling is not required to get a complete view of your source code logics. This is a non standard way of displaying source code, so it is disabled by default. Jungle Ide supports a special edition mode that recreates the end of line behavior of ancient editors such as the Turbo C editor, or QuickBasic editor. Those editors didn’t make the caret jump to the next line when the last character was found. Jungle can mimic this too. Enable this option if you want Jungle Ide to stop detecting automatically the appropriate encoding for each document, and use always Unicode encoding. Select this option if you want Unicode documents to be saved using Big Endian encoding. Otherwise default Unicode encoding (little endian) will be used.